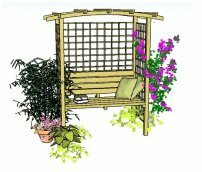 I am a bit of a DIYer and like to turn my hand to things so when the pergola idea took hold I needed to find a starting point - and hey presto - 'Pergola Plans 4 free'. Whilst there were plans for rectangular pergolas on the site for free, I needed one to fit into a corner and Di came to the rescue. 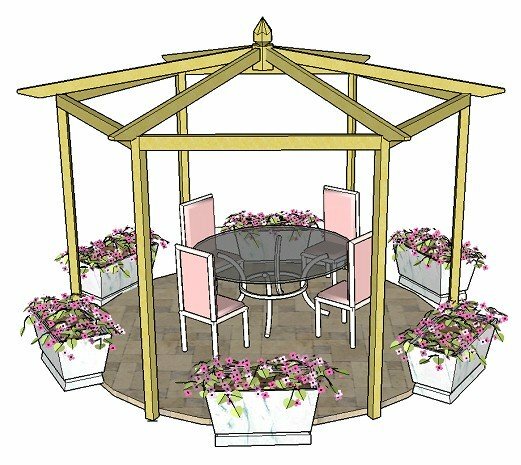 Whilst the plans for her corner pergola were not exactly what I needed (mine needed to be 3-sided rather than 5-sided to fit around the deck) Di and I exchanged several emails and with her experience and expertise, she modified her plans to suit my needs - all I had to do was build it! It is fair to say that the most difficult part was the metposts! They do not like stony ground so of the 5 only 1 went in as expected - so be ready to take them out, cut some of the spike off and resort to plan B - concreting them in! The rest, as long as you follow the plans is straight forward - measuring, cutting and building - you do need someone to help to hold things from time to time and the Black and Decker Workbench, reciprocating saw (second hand off eBay) and cordless drill/driver are vital in my view. I got all the wood off the internet (delivered) and sold the 'scrap' on eBay at the end. What more can I say - just follow the instructions and use Di's experience if you get stuck - she returns your emails within 24 hours. Comments for Capturing the Sun! Would love to link to great blog so my website visitors can enjoy it too. My site is a patio ideas site with links to relevant sites. 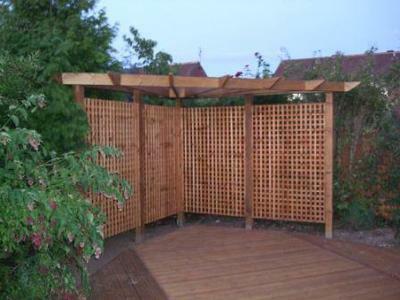 What a fabulous corner pergola Ray! You've done really well. I bet you're very proud of your new creation. It shows how the plans can be effectively adapted to fit any situation. The deeper stain gives you pergola a rich feel and a great finish. Metposts can be tricky. Another option is to use Concrete-In Metposts so the holes can be dug out more easily. Thank you for sharing your story with us, and I hope you enjoy many hours soaking up the sun! Join in and write your own page! It's easy to do. How? 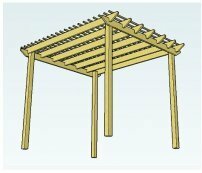 Simply click here to return to DIY Pergola Stories.